Wood and natural textures bring freshness and elegance, so a marvelous way to incorporate these organic essences into the design of a room is to use them for window treatments. They will transform any kind of window into a great visual element within a space, by adding depth and character. Thanks to their sturdy silhouette and complex louver systems, wood shutters ooze sophistication and give a feeling of aristocratic grandeur. But that doesn't mean they are not versatile. In fact, paired with stripped patterns or neutral fabrics, they can easily dress the windows of a beach house; combine them with plaid or patchwork curtains and soft knits and you will get a cozy cottage look. Arched, round or other odd-shaped windows will turn into true architectural gems with hardwood shutters, as they will highlight their unusual shape in a lavish manner. The possibilities are endless, however, you will always enjoy their classic appeal. 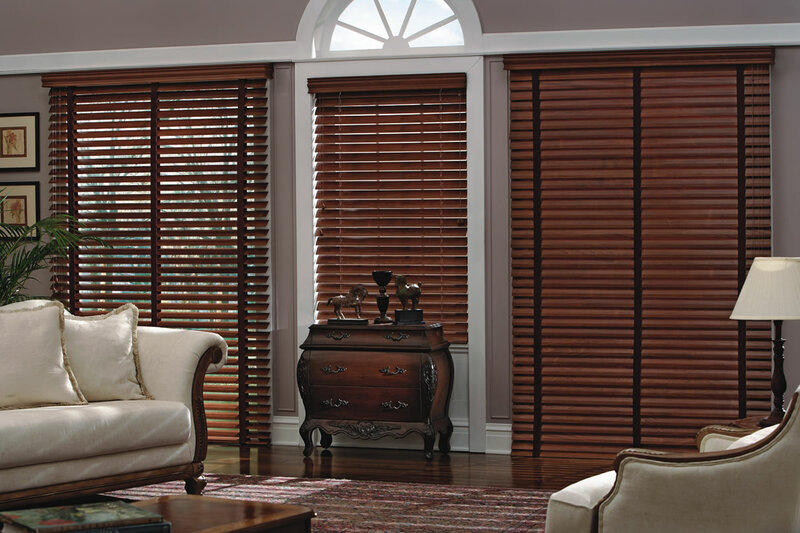 Wooden blinds showcase the richness of natural grain through the generous width of their horizontal or vertical slats. For a three-dimensional experience, opt for beveled profiles that reflect light from two different angles; the refined glow will instantly liven up a dull room. Accessorize them in order to add extra subtlety: customize their look with decorative tapes that echo other upholstered furniture pieces or contrast dark essences with elegant white window trims. Ecological design solutions play an important part in our modern culture, so nowadays we can enjoy luxurious window coverings without damaging the environment. Faux wood fashions feature equally plush stains and elegant brushed textures, as contemporary technologies can perfectly emulate natural patterns. Window treatments made from alternative wood are also sturdy, they do not chip, crack, warp or fade; therefore, they can be installed in areas with high humidity levels, such as the bathroom or kitchen, to emphasize the sense of lavishness. 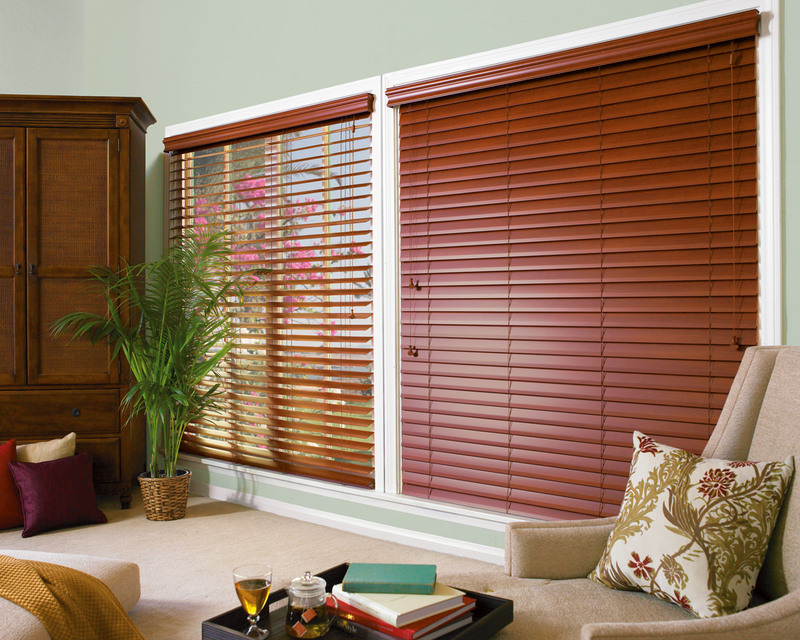 Available in virtually any color or finish you can think of, synthetic wood blinds are highly versatile, allowing you to experiment with unexpected tints, without skimping on quality and beauty. Another way to enhance the look of your windows with texture and natural fibers, but from sustainable sources, is to opt for woven wood shades; made from different types of grasses, weeds or twigs, they are easy to assort with both modern and traditional interiors. By bringing warm diffused light inside the space, these shadings bring a relaxed feel and a stunning visual impact. Despite the fact that both natural and man-made wooden treatments are impressive on their own, it is also possible to pair them with other layering elements, in order to create depth and intrigue. Rich curtains, drapes in neutral colors or edgy valances will complement the organic look and accentuate the architectural feel of the windows. Both natural and alternative wood window fashions will create gorgeous focal points around the windows with their wire-brushed finishes and handsome patterns, bringing attitude and warmth to the overall décor. Use them in conjunction with contemporary or classic interiors and you will never go wrong. 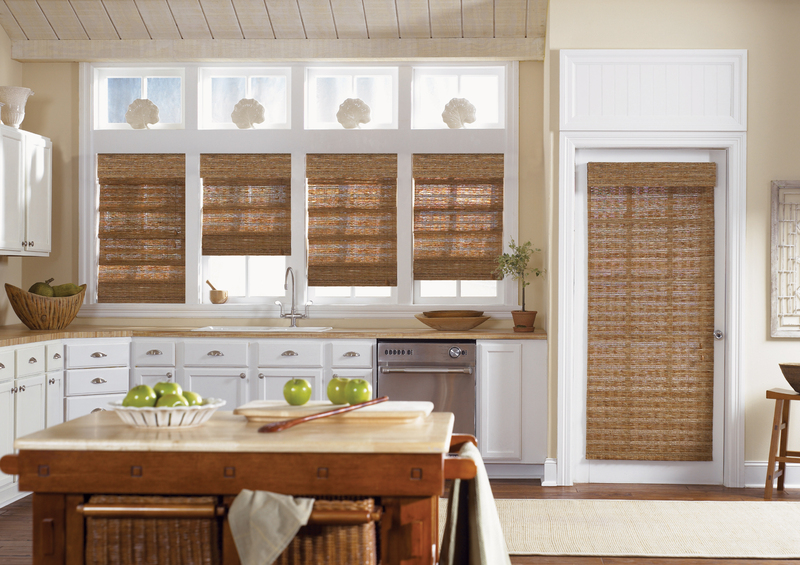 Woven wood shades are an alternative to hardwood window treatments, offering a more textured look. They are often made of twigs or different types of grass or reed, coming in various shades of neutrals, such as cream, brown, beige and so on. Also, a very popular material nowadays is bamboo. Whatever the composition, this type of coverings will diffuse light in an elegant manner, adding a touch of natural elegance to a space. They are also highly versatile, as they can be paired with luxurious curtains or minimalist shades in both modern and retro environments. Another advantage is that their organic fibers will perfectly insulate your home, keeping the space cool during summer days and warm during winter. Wooden blinds add classic distinction to your windows, so by pairing them with decorative tape instead of the usual boring cords you will definitely bring their look to another level. Fabric bands can be used to break the uniformity of horizontal lines and add an element of interest, especially when dealing with wooden blinds for wide windows. So why not incorporating the textures, colors or patterns found on other pieces of furniture in the room, for a consistent customized look. When stacked, the window coverings will form elegant folds of decorative ribbons that will make them look even more sophisticated. Wooden blinds always bring texture and chicness to a space, but their defining effect can be further enhanced by a simple visual trick: adding a white window trim. The instant brightness will create a bold contrast with darker essences, giving a feeling of grandeur and sophistication. The white trim along with the horizontal lines of the blinds also create the illusion of width and length, making small windows appear larger, thus balancing the room’s proportions. Blinds also allow great light control and the bright window borders will pick up the sun rays and intensify their stunning effect, filling darker spaces with a cheerful glow. 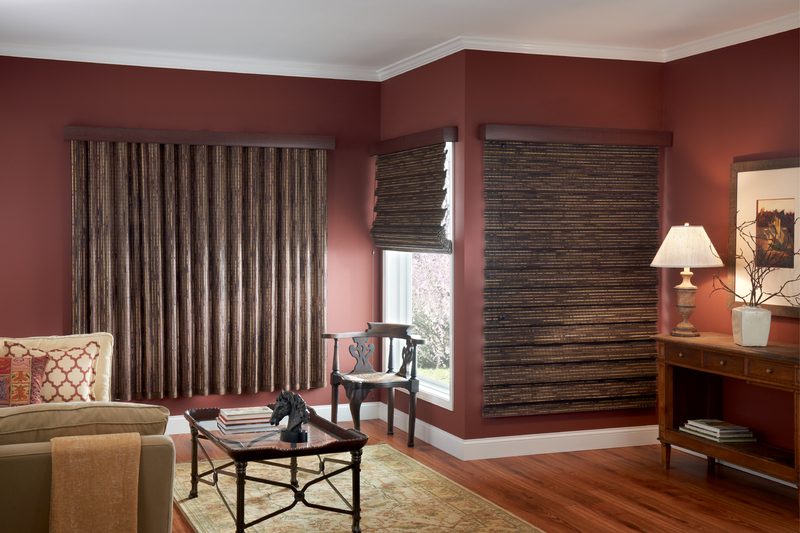 Woven wood shades can counteract the look of stark and uninviting spaces, or can simply add chicness to a refined décor. But to further underline their relaxed, cozy appearance, the solution is layering. By adding valances, you can transform the windows into exquisite focal points and create a flattering three-dimensional perspective. Use natural fabrics like hemp or linen that complement the textural feel or employ valances made from the same organic materials, for a consistent design. They will also mask unattractive hardware and you can customize the edge banding to make them match other upholstered items in the room. Faux wood plantation shutters are ultra-versatile and work in various interiors, creating a relaxed ambiance. The alternative materials that they are crafted from offer enhanced durability and UV protection, to avoid costly deterioration. Moreover, they are available in virtually any color you can think of; they can be painted in vivid colors for a nursery, in warm neutrals for subtle elegance and contemporary feel, or they can showcase stunning textures that perfectly emulate rare and expensive natural essences that would be otherwise impossible to purchase. 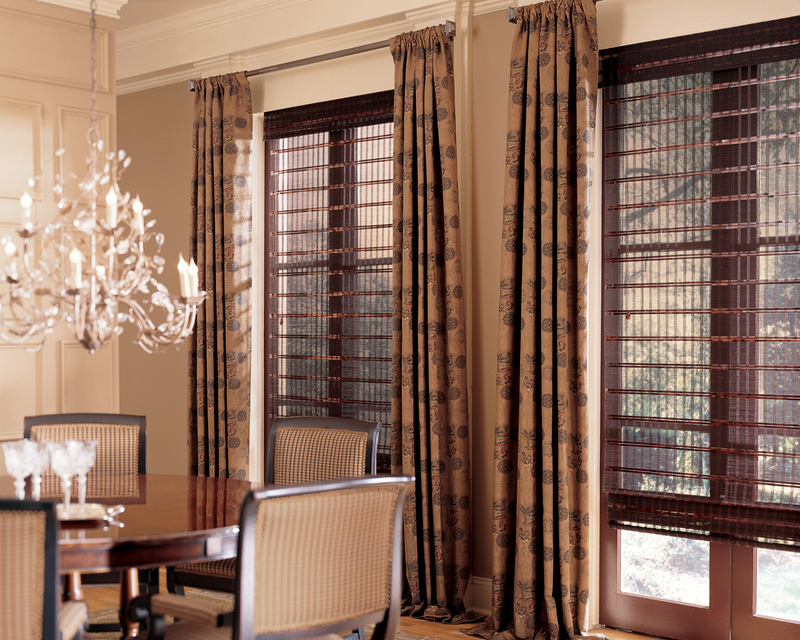 These man-made window treatments also go with themed interior designs. For a nautical décor, pair them with striped patterns in navy and white; if you are going for a holiday look, combine these coverings with checkered textiles and warm knits and the result will be an inviting cottage atmosphere. 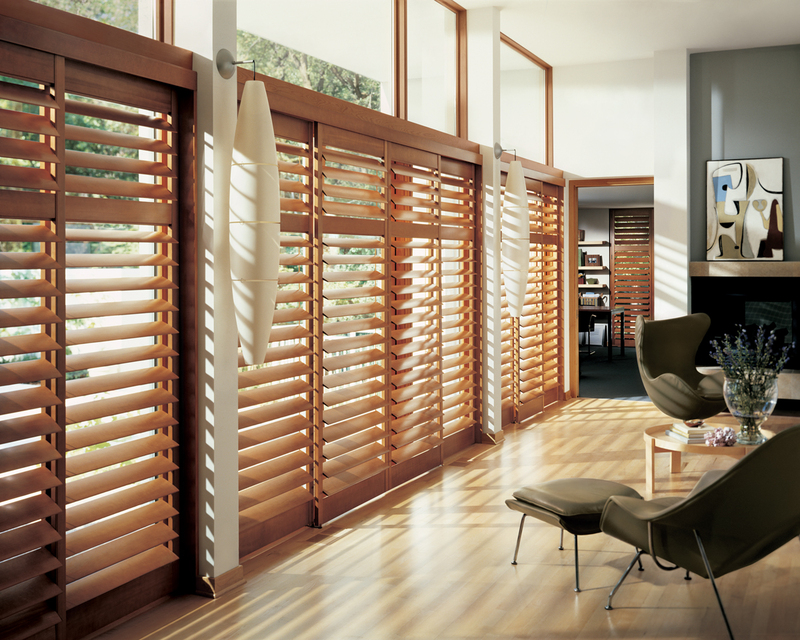 Natural wood blinds are elegant, but do not work very well in spaces with high humidity levels like bathrooms. Therefore, an equally plush but more effective way to make your lavatory look stylish is to employ faux wood blinds. Nowadays, they come in intricate designs that perfectly emulate natural essences, while offering alternative materials that will never be subject to warping, fading, cracking or yellowing due to moisture, heat or dust. 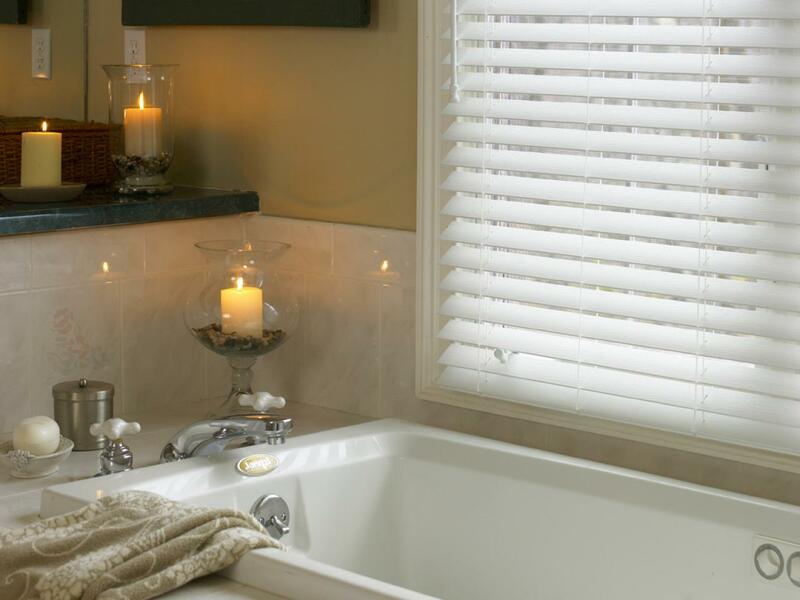 This type of window treatments will help you enjoy your relaxing baths without having to worry about deteriorating your stylish blinds. If treated correctly, odd-shaped windows can lend ultimate distinctiveness to a space, turning what first looked as a challenge, into an architectural gem. With lush wood shutters, there is no need to hide the unusual silhouette of a window behind curtains and over-embellished valances; the natural elegance of the wood grain will find a great place to stand out and to be admired, as the atypical angles will only highlight the beauty of the slats. Arched or circular windows can be emphasized with wooden shutters that resemble Asian hand fans, for an extra decorative touch. Bay windows are ultra-stylish and deserve special attention when decorating; the right treatments should make their sophisticated shape stand out among the other windows of a house. 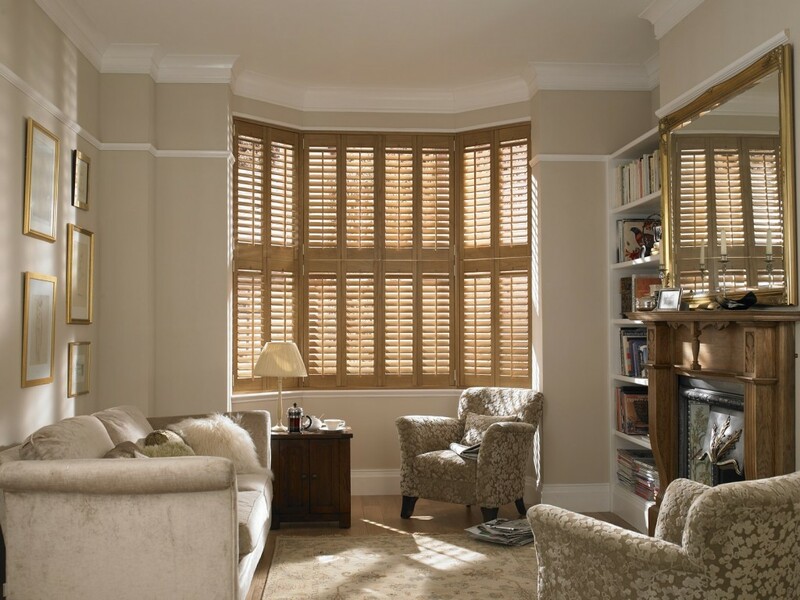 So what better way to define their romantic appeal than installing wooden shutters? Due to their impressive appearance, every elegant line of the alcove will be highlighted and enriched with gorgeous grain textures and sleek finishes. Moreover, depending on the dimensions of the bay windows, the size of the slats can be adjusted to underline even more their elegant silhouette. The mobile louvers will allow a perfect control over the incoming light, turning the nook into a cozy little space for reading or daydreaming. Tiny windows can create the feeling of a dark, uninviting atmosphere, so the great textural elements brought by natural fibers will balance over compelling walls and will add depth and interest. Additionally, these wood coverings are able to diffuse light in an elegant manner, warming up the space and making it feel more welcoming. The captivating designs of woven twigs, grasses or reeds will also turn small windows into a great focal point, so in order to achieve a sleek design and give the illusion of height, hide the hardware behind a matching head rail and install the treatments just above the window frame. Woven wood shades bring natural elegance to a room through their great ability to diffuse light and create a marvelous ambiance. If your window wall offers enough space for curtains to be stacked back, then opt for pairing woven shades with long, rich drapes that will only bring additional depth and lavishness. A heavy ornate fabric will make your shades ooze classic sophistication, while neutral-colored textiles that hang well will impart a relaxed feel to the overall décor. To finish off, use elegant drapery rods and always make sure to install a matching head rail for a sleek fashionable appearance. Just like in the fashion department, layering is key if you are going for elegance and distinctiveness when it comes to interior design. With their rich details and sleek massive lines, wood shutters are the perfect starting point in giving a feeling of grandeur to a space. Enhance their richness with luxurious curtains that feature intricate velvet or brocade patterns, for timeless appeal. In case you are going for a modern look, add neutral-colored curtains made of heavier fabrics that hang well and create numerous folds. 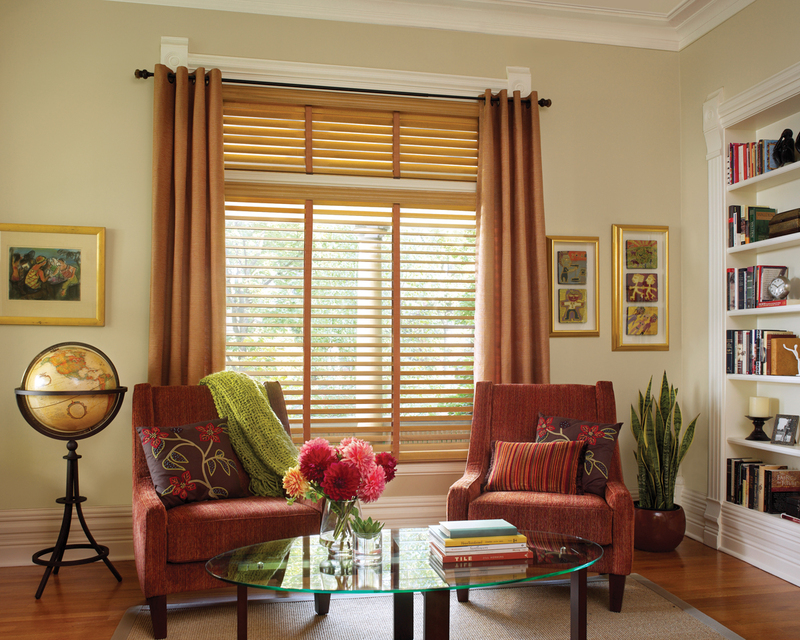 Whatever the case, opt for a floor-to-ceiling length that will maximize the sophistication of your hardwood shutters. In case your house is blessed with wide window expanses, vertical wood blinds will heighten their dramatic appearance through the elegant vanes that are able to showcase the richness of natural essences. This window treatment is ideal for those who love intricate wood grains and would like an opportunity to showcase precious materials and beautiful stains; this type of window coverings will also provide a gorgeous backdrop for opulent furniture. Vertical wood vanes can glide to one or both sides of the window, exposing natural light in a truly theatrical way. 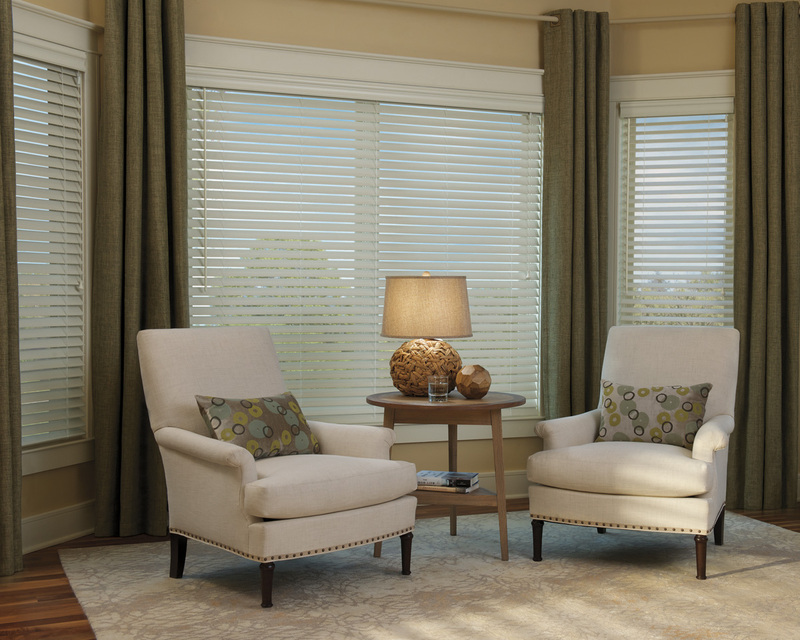 That is why these blinds will work the best with floor-to-ceiling glass surfaces. 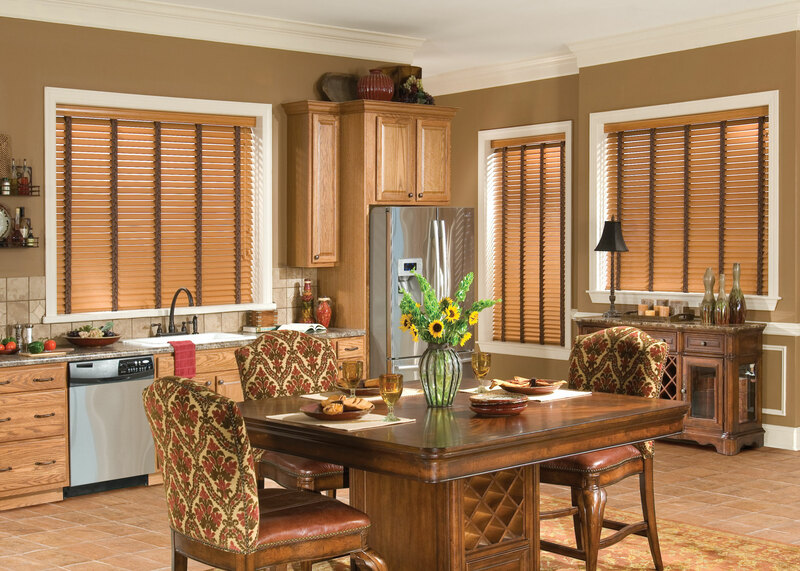 Hardwood blinds will surely create a focal point around your windows, by offering definition and elegance with their slats and rich grain detailing. Depending on the size of the window, you can also play with different slat sizes for an architectural look: smaller windows require narrower slats to make them look larger, while oversized ones work best with wider pieces. What's more, they come in a great range of essences, textures and color options to choose from, so that you can find the perfect tint to either complement or contrast your other wooden décor elements, such as the floors or furniture. 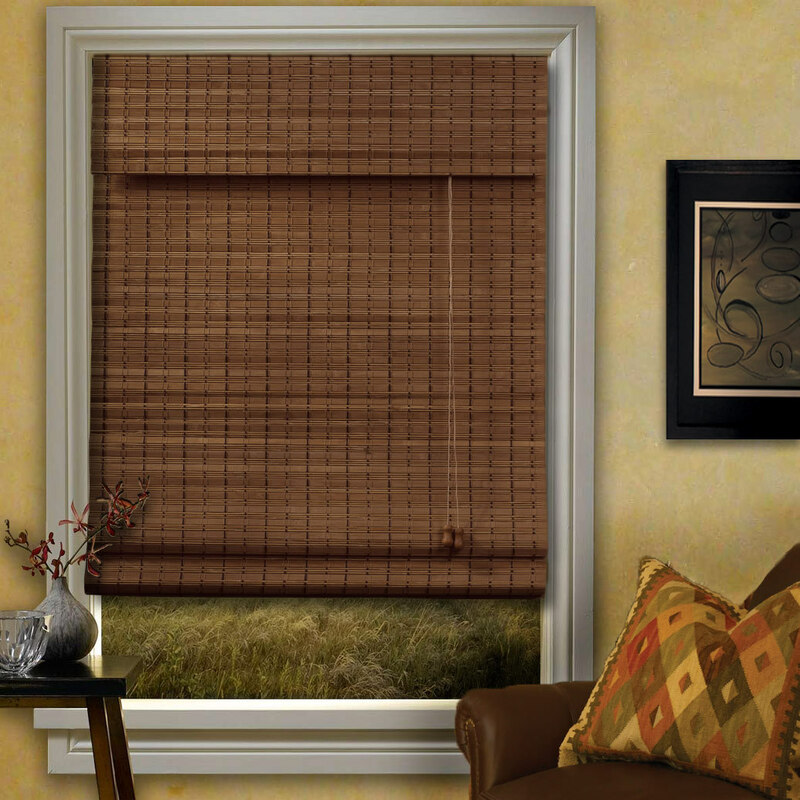 Faux wood blinds are a great budget-friendly solution to jazz up your windows. You do not need to worry that they will look tacky; with the help of modern technologies, you can get alternative wood blinds that perfectly imitate the color and texture of natural essences. Additionally, being made of resistant compounds, these coverings will not crack, chip or fade; they are also considerably lighter than real wood treatments and have the huge advantage of not warping, hence, they will last a lot more. Because of that, if you intend to create a lavish décor in rooms with high humidity levels, like the kitchen or bathroom, faux wood fashions will turn out to be the perfect choice. 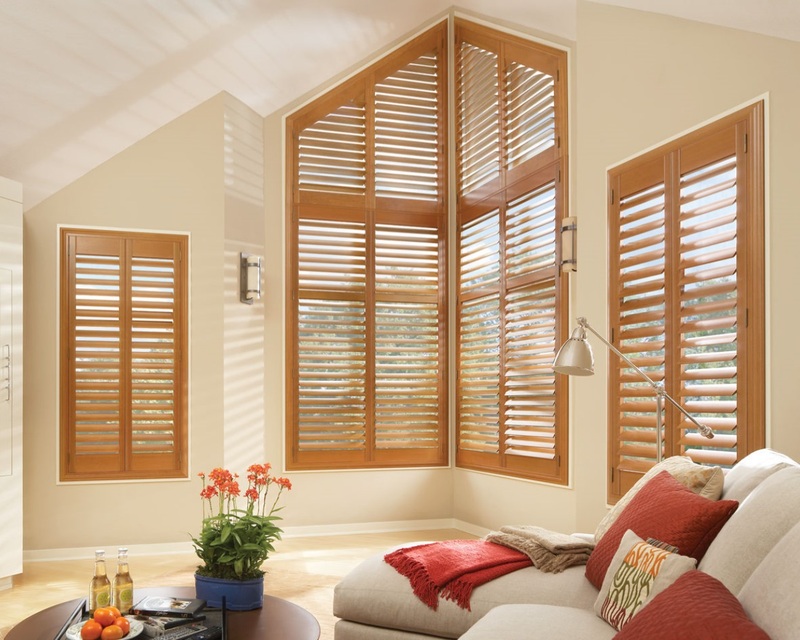 Wood shutters bring a highly architectural feeling to any décor due to their massive silhouette and complex louvers. They are capable of making a space look grand, while adding warmth through their rich grain and lush tints. 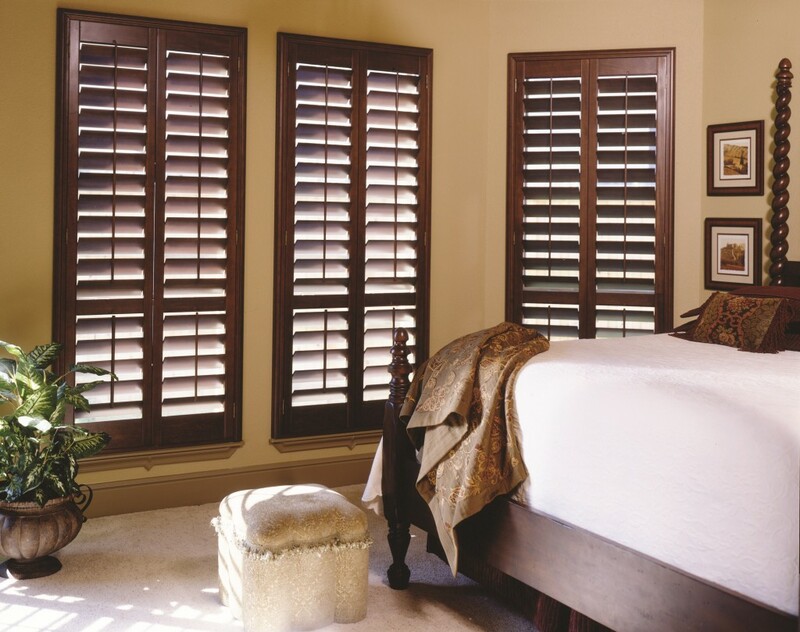 Unlike wood blinds, shutters can offer total blackout when closed, making them perfect for guarding your privacy or for maintaining the house cool during extreme heat. Despite their impressive appearance, wooden shutters are extra versatile: they are great at creating the feeling of coziness in a rustic house, but can also be employed in combination with modern finishes and metallic appliances. Wooden window treatments look elegant and impressive on their own, but their character can be further emphasized by adding valances made from the same organic material. 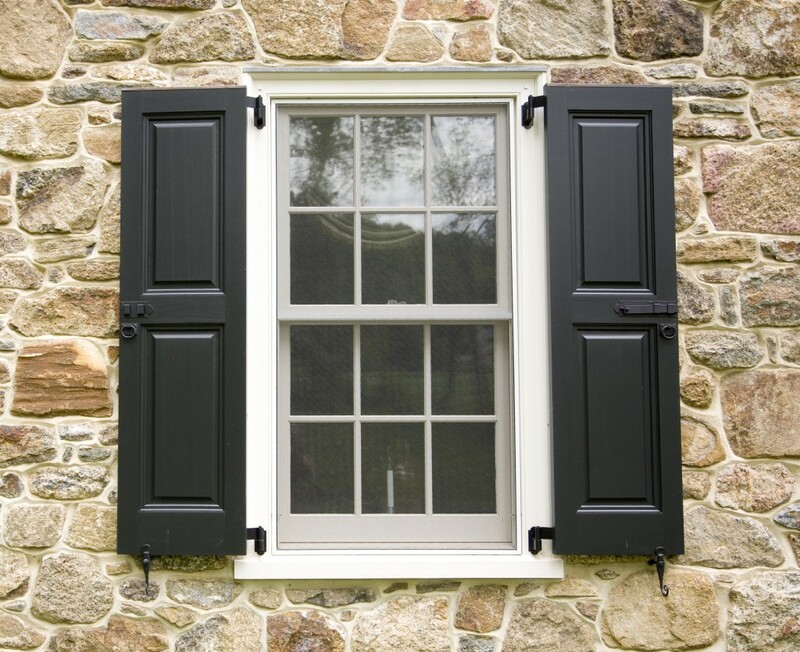 They have the advantage of masking unflattering hardware and provide the impression of higher windows when installed above the top edge of the frame. For a charming cottage décor, valances can be made from raw wood planks or from reclaimed pieces that will add character to the space. For more high-end designs or minimalist approaches, simply install sculptural cornices that bring definition and sophistication. These toppers also look lavish when paired with rich recessed curtains that extend from the floor to the ceiling. 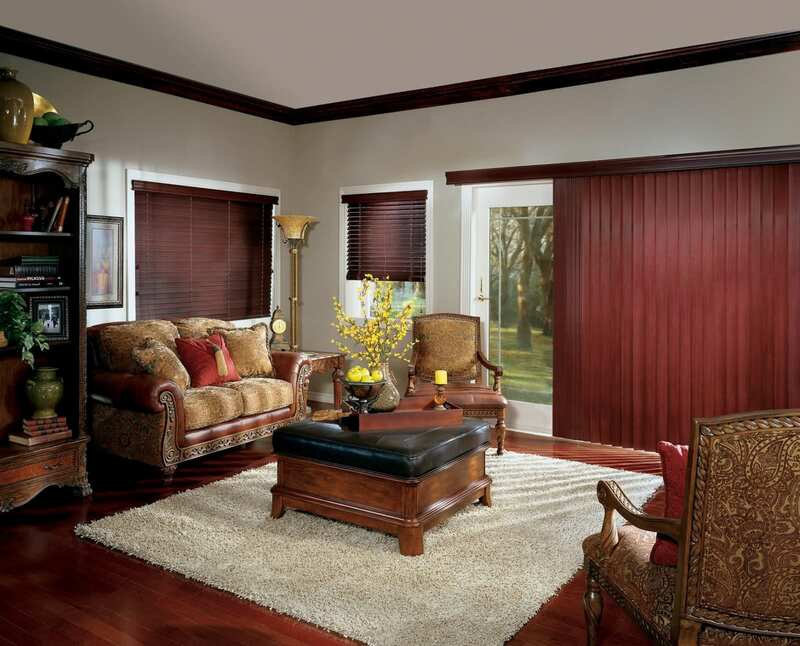 Due to their durability and sleek finishes, faux wood blinds work in many different environments; modern manufacturing techniques offer great textures and nature-inspired stains without affecting the environment. 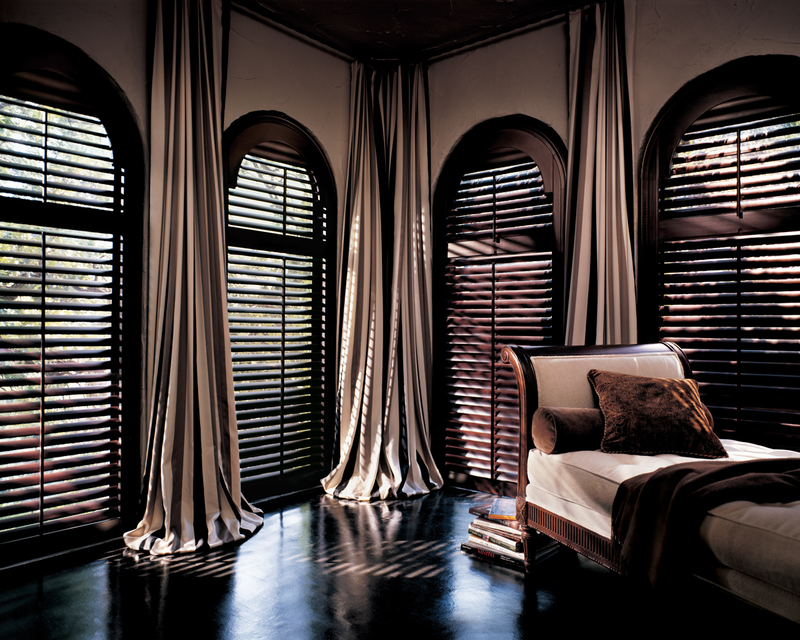 However, you can add more drama to their exquisite appearance by opting for 2-inch slats. This width allows elegant designs to shine, turning your windows into true centers of attention. Moreover, larger windows will benefit the most from this size, as they will look more balanced and impressive. Another great tip is to choose 2-inch slats with a beveled profile, so that the exterior light can be reflected in the room from two different angles, for extra refinement. There is something about white that brings a crisp feel to both classic and modern interiors, and this quality applies to wooden blinds as well. White blinds with wooden slats will complement today’s furniture pieces by creating a bright backdrop for them to stand out. Go for elegant matte finishes and wire-brushed surfaces in order to add depth and interest to the décor and to avoid a tedious plastic-like appearance. 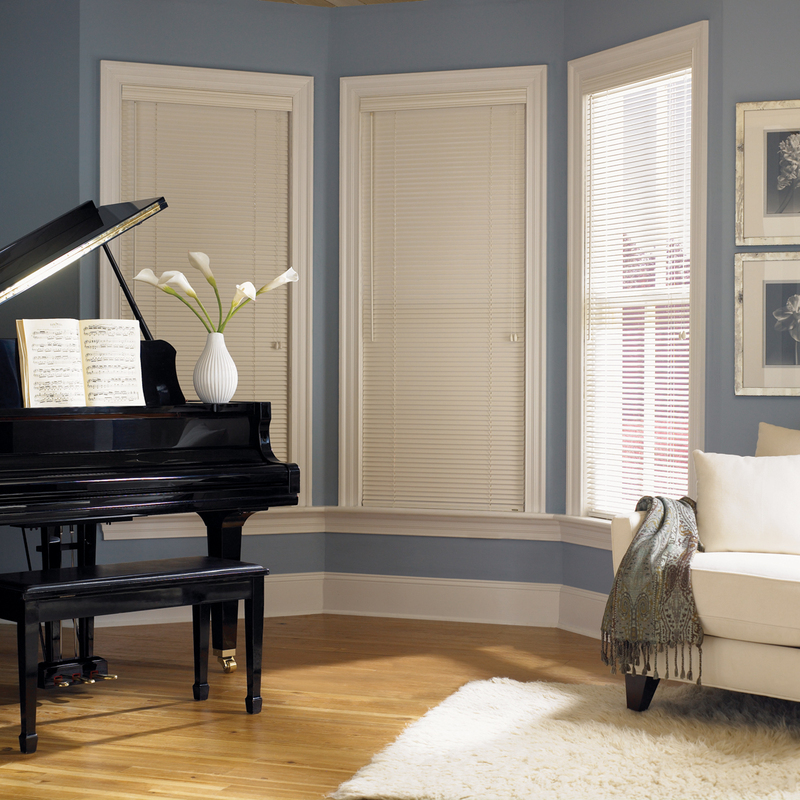 By opting for beveled slats in a larger size, you will also add great character and complexity to the design. To boot, complete their contemporary look with a sculpted cornice for ultimate definition. Modern design leans towards simple lines and clean contours, so faux wood shutters provide a minimalist, yet classic way to showcase the silhouette of any window. For a contemporary feel, they are available in fun vibrant colors, down-toned pastels or even crisp white. Modernity also means employing budget-friendly and ecological decorating solutions, so the synthetic materials used in their manufacturing process will help to reduce maintenance costs, preserve natural forests and use energy more efficiently, without affecting the environment. Additionally, the graphic character of the hefty horizontal louvers goes well with the latest fashions in interior design, by seamlessly complementing industrial finishes and bold furniture pieces. 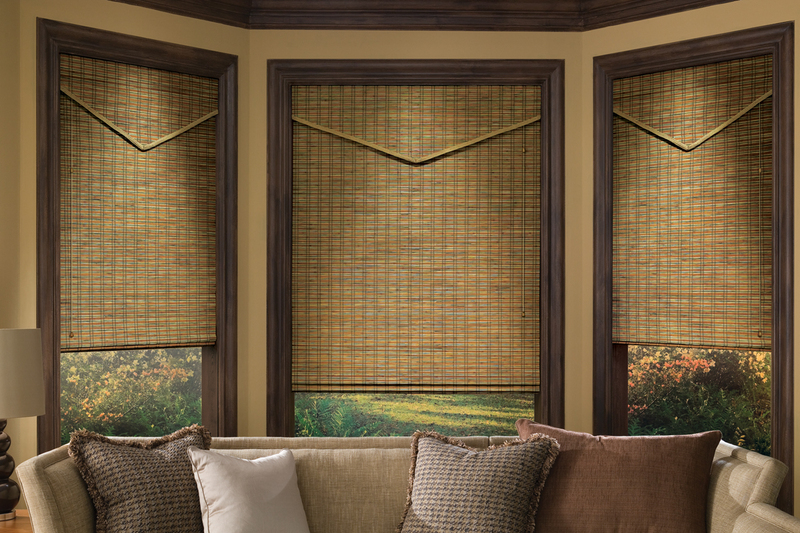 Thanks to their natural textures, woven wood shades bring a breath of fresh air into a room. However, by opting for the luxurious Roman stacking system, you will obtain a romantic, yet contemporary design. The plush folds create the idea of organic movement and underline even more the rustic appearance of woven reeds, grasses or twigs. Both the windows and the space will gain beauty and distinction, making you feel more at home. To boot, the elegant pleats work very well with lush fabrics, for traditional styling, or with metallics and natural stone, for modern appeal. Exterior wood shutters will definitely add serious European flair to the façade of your house. Light-colored outer walls or bright window frames will make dark essences pop, creating an elegant contrast that immediately draws the attention. For added refinement and a more contemporary look, choose simple, yet sculptural designs enhanced with metallic ring knobs and matte stains. Shutters made of reclaimed wood or simple planks inspire a rustic Austrian-chalet feel, especially if painted in lighter monochromatic tints. And if you fancy a British twist, hang wooden shutters over exterior walls with exposed bricks, thus creating a raw, yet polished appearance.